FOOD TRIP: SORRENTO, VIC – Travella.com.au, The Travel Blog with no carry-on, hotel reviews, airline reviews and food reviews. Travella.com.au, The Travel Blog with no carry-on, hotel reviews, airline reviews and food reviews. It’s always a shock to the system when something you eat at a place is more memorable than the place itself. For me, that’s my memory of Sorrento. Not the beautiful calm waters or idyllic and orderly but slightly-Stepword Wives nature of the town, but for one of the best, most simplest treats I’ve ever eaten. The day before I turned 30 I was on my quest to continue to travel to places I’d always heard of but had never been to. 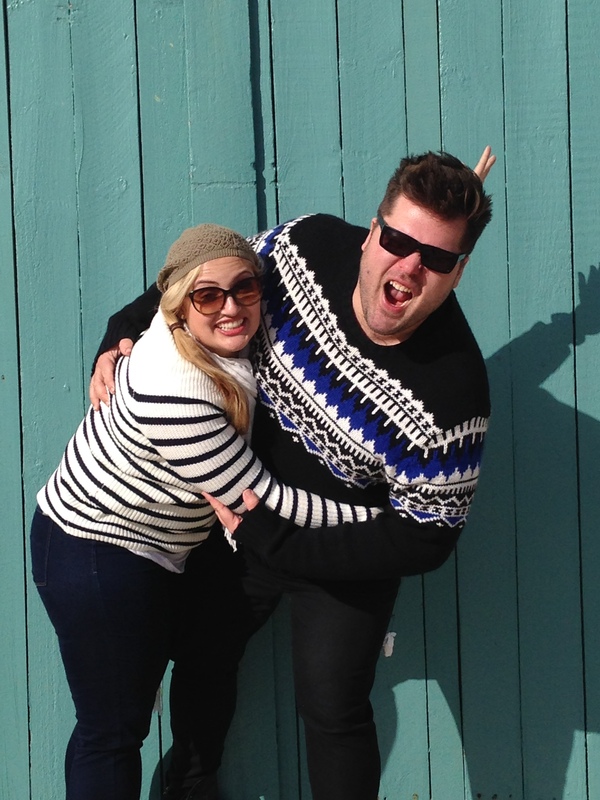 I was in Melbourne for the weekend to celebrate the beginning of the end of my life, and together with a few friends, we rented a car and drove to as many of the towns along the Mornington Peninsula as we could in a day. 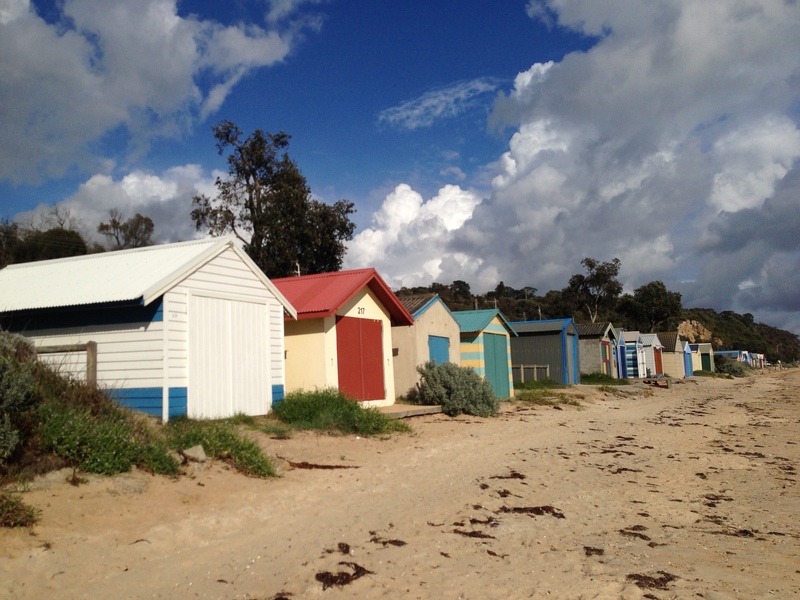 Secretly I always felt a pang of jealousy when people talked about visiting the Mount Martha Vineyards or the originally elusive but oh-so-colourful beach huts dotted along the shores of Dromana, Portsea and Mt Eliza. I had seen plenty of photos of them on Facebook, on travel sites, but had never been there myself. After a quick stop in Dromana to take a million photos of myself and my friends in front of the huts to satisfy the demands of Instagram and Facebook profile pics for years, we continued on to Sorrento. Starving from all of the exhausting work of selfie-taking and with Tina Arena’s Sorrento Moon blaring, we drove into the town of the same name and proceeded to eat everything in sight. First stop was the aptly named Buckley’s Chance, (7 Days a week, 174 Ocean Beach Road) which funnily was also the odds I gave myself of not eating the menu before the food arrived – the service was not slow but we were very hungry. Lemon Pancakes were the highlight and even the 2015 ‘Caesar Salad’ of menu items, the ubiquitous Smashed Avocado on Toast, was actually a stand-out. Fresh and delicious. Our food crawl continued way up Ocean Beach Road with a visit to the puntacular Fish Fetish (27 Ocean Beach Rd) – I myself am not a fan of eating anything featured in The Little Mermaid, so I’m only being guided by my friends tastebuds who said the fish was good, but not great, considering our seaside location. I can attest though that the chips, served well salted in paper and with vinegar, definitely provided me with 50 Shades of Yay – sorry, it’s all I could come up with on the fetish front. Finally, with bellies full of both food and regret, we accidentally stumbled upon the regal-looking sign of Just Fine Food (23 Ocean Beach Road) which I can proudly say, was the best accident I’ve ever had in my life. 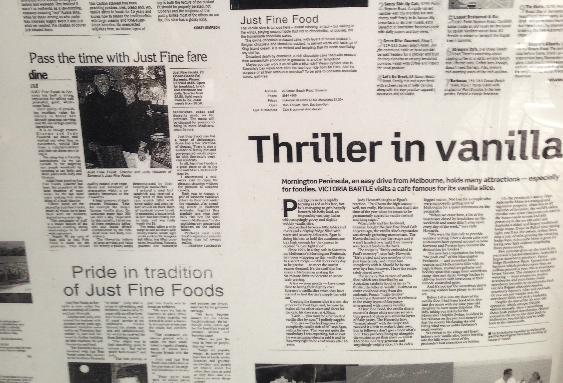 The writing was on the wall, literally, the front window was plastered with reviews of Sorrento’s Famous Vanilla Slice with headlines like Thriller In Vanilla I just knew I had to have a crack. And what a crack it was. Even though I was warned by the server that the slice was definitely filling, I decided to go for a double hit of vanilla in both milkshake and slice form to see which one would steal my attention, but the slice was obviously having none of that when it arrived, both XXL in size and jiggling on my plate. This is hands down the best vanilla slice I’ve ever eaten in my life and I have consumed a few. Flaky icing-covered pastry, dense, super-creamy vanilla custard and a super thin spread of jam that was a surprise and a delight. This made the 2.5 hours or so of driving all worth it and provided me with enough of a sugar rush that it only seemed like a quick jog back to Melbourne.